Inversion ankle sprains are the most common ankle injury. They occur when you step on an uneven surface on the inside of your foot and your foot rolls toward the inside of your body. Your ankle may pop and then you have instant, excruciating pain running up your leg. Just because your ankle popped doesn’t mean that something is broken. Most broken ankles come from an eversion sprain. Not moving and holding your ankle tightly is a common response. Some people experience a lot of swelling, others not so much. The swelling usually occurs on the outside of the ankle near the ankle bone and its not unusual for the swelling and bruising to move to the toes. It all depends on how bad the injury is. 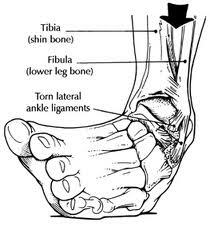 Now you know that your ankle injury is probably not that bad. So what do you do now to get back to your life? Start a proven rehab program. You can get the best rehab program available in just a few minutes.